This set of C Multiple Choice Questions & Answers focuses on “General Utilities – 6”. 1. What will the code display on compiling? Explanation: int atexit(void (*func)(void)) calls the specified function func when the program terminates. we can register termination function anywhere in the program, but it will be called at the time of the program termination. Explanation: void exit(int status) function is used to terminate the calling process immediately. 3. What will the following code do on compilation? Explanation: int system(const char *command) function is used to pass the command name or the program name specified by command to the host environment to be executed by the command processor and returns after the command has been completed. 4. 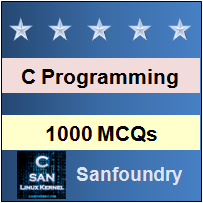 What will be the output of the following C code? 5. Initial seed is ________ for the function srand(unsigned int seed). This function returns a new sequence of pseudo-random numbers using the specified seed.Initial seed is 1. 6. Which statement is true with respect to RAND_MAX? Explanation: RAND_MAX specifies maximum value that has to returned by the function rand(). rand() function returns a pseudo-random number in the range 0 to RAND_MAX. 7. Which of the given function differs from the statement’errno is not neccessarily set on conversion error’? Explanation: The function atoi() and atol() are similar to strtol(), atof() is similar to strtod() except that errono is not necessarily set on conversion error. 8. void free(void *p) performs which of the following functions? This function de-allocates space to which p points(if p is not NULL). 9. Which of the given option is declared under the header file stdlib.h? Explanation: SEEK_CUR and SEEK_END is defined under stdio.h, CLOCKS_PER_SEC is defined under time.h, EXIT_SUCCESS is defined under stdlib.h. EXIT_SUCCESS specifies value for status argument to exit indicating success. 10. MB_CUR_MAX is not defined in stdlib.h. Explanation: MB_CUR_MAX is defined under header file stdlib.h . MB_CUR_MAX expands into a positive integer expression.It is the maximum number of bytes in a multibyte character present in the current locale.